For the owner and crew Caminos, winning the J/109 North American Championship at Block Island Race Week earlier this summer was a family affair. Don Filippelli’s Caminos had long been a threat in the J/109 fleet, but had never won a big regatta, let alone a North American Championship. 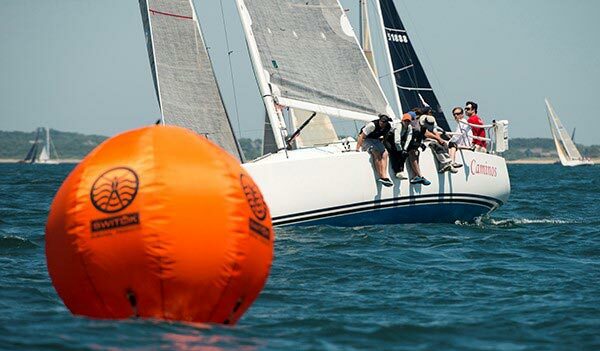 After recently switching to Quantum Fusion M sails, Caminos, skippered by Filippelli’s son-in-law Ryan Dempsey, finally brought home a long-coveted trophy at this year’s Block Island Race Week in Rhode Island. Dempsey, a former University of New Hampshire sailing coach, really got into racing when his family bought a J/80. When he met Filippelli’s daughter Tina, he asked her to go sailing, but at first she refused—she didn’t gravitate toward the sport as a kid. Eventually she relented and honed her racing skills on the J/80 before starting to race on Caminos, first in the sewer and now as pit, a position she’s held for the past three or so years. To call tactics, Dempsey called on his long-time J/80 sailmaker Terry Flynn of Quantum Seabrook. “It was my first time sailing with Terry. He was exactly what we needed. Personality-wise, I knew he’d fit in well with the crew,” said Dempsey. And, Caminos was due for a new set of sails. “We’d been with North for a long time, but we felt we were ready for a change, and it was a good opportunity to get Terry on board,” said Dempsey. The new sails were delivered only a couple of weeks before the regatta, and they only had one opportunity to put them up, just to make sure everything fit. “When we got to Block Island we went through the tuning guide that Quantum provides and went out sailing,” said Flynn. The Caminos crew had two days of practice on Saturday and Sunday before five days of racing kicked off on Monday—there are three buoy races most days, with one 23-mile round the island race. During the week, the racers faced just about every feasible condition, with postponements on a couple days due to light wind, to gusts to 30 knots during the round the island race. It was the first time Dempsey and Flynn had sailed together, and most of the crew was new to the boat, including a squirrel they picked up on a crew board in Annapolis, but Dempsey said he had a feeling everyone would get along well. “I enjoy putting teams together and I like to think I do a good job of it. Not just in terms of finding people who are good sailors, but people who would work well together,” he said. Dempsey’s knew his main and jib trimmers Mark Gorman and Bruce Sawyer, through J/80s but had little experience sailing with them. “I had confidence with Terry on the boat, that he could help out trimmers. With that knowledge Bruce would be able to execute it,” said Dempsey. “Terry was really the show on the water, I need to give a lot of credit to him, and Tina does a great job with setting the groundwork. She’s a clinical psychologist and she really appreciates how setting the stage goes a long way to getting everyone to work together as a team quickly,” he added.